In Windows 7, when you press Alt+Tab to switch between applications, the Alt+Tab window displays thumbnails of each program. However, many users prefer the traditional program icons like in Windows XP. This step-by-step guide describes how to bring customize the Alt+Tab window back to XP appearance. 1. Press Winkey + R to bring up the Run box. 2. 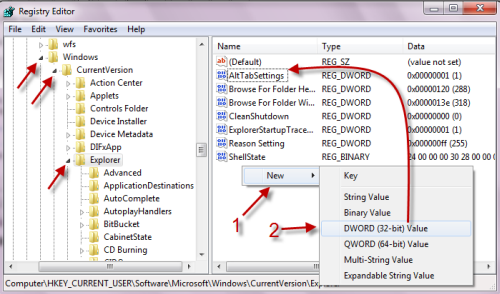 Type Regedit and hit OK to access Registry Editor. 5. 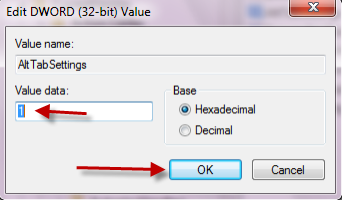 Double click on AltTabSettings and change its value to 1. Hit OK.
6. 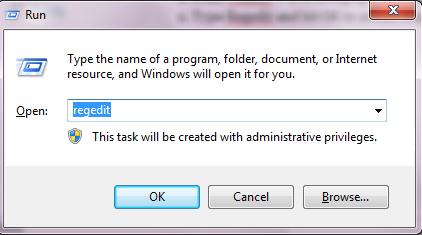 You can close Registry Editor now. It should take effect immediately. But it is not, try to log off or restart your computer to make it works.